In case if you own a Smartswitch system, you can sell SMS-based services to your clients (both end users and corporate). Clients call services, using a predefined set of commands. You can assign other labels to commands. Commands can be mixed in arbitrary order, for example you can refill and trigger a callback in a single SMS. Figure 1, Dial using SMS-command. Imagine, that you are a Provider1. User (probably he has bought a prepaid card from you) sends SMS that looks like "D380673334445" to your service access number. SMS reaches SMS-gateway, and then a Smartswitch, for example by HTTP (or by bluetooth, if the SMS gateway is a cellular phone). The latter handles SMS, authorises the user and triggers a direct call to the number 380673334445 via Operator1, When answered, system plays audio prompt (probably, saying something like "Please , hold on") and calls the SMS sender (callback) via Operator2. When answered, system bridges users together. System hangs up the call as soon as user's balance becomes non-positive. 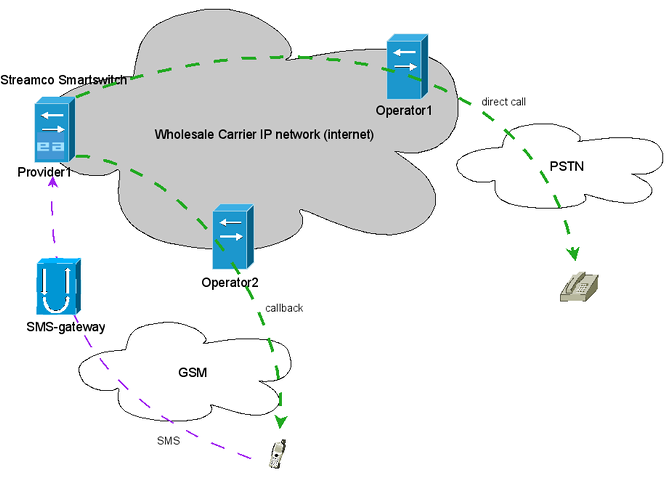 After hanging up, system accounts calls and sends balance to user by SMS via the SMS-gateway. This is just an example, you can implement a completely different scheme, using Graphical constructor.